Ernie Murphy: "I am a 57 year old lifelong Levittown resident living between the right of way for the Long Island Motor Parkway and the Central Railroad, and have an interest in the history of the area.The picture was taken in 1950 or early 1951, behind the house at 173 Orchid Road in Levittown and shows a Motor Parkway_______________? 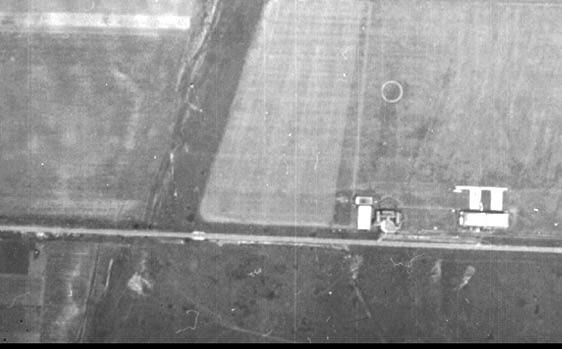 I believe it appears in other Levittown aerials as seen below." After reviewing the below photos, aerials and surveys and consultation with my favorite co-author Al Velocci, I have determined that the structure was a culvert built by the Motor Parkway to divert flooding and streams from disrupting the road. Other Motor Parkway culverts are shown below. Congrats to Frank Femenias for getting the closest to solving the Mystery Foto as a "bridge over troubled water." Thanks Ernie for submitting the Muystery Foto and Steve Lavey for documenting it. If you have a possible Mystery Foto, please forward it to Howard@Kroplick.com . My brother Mitch and I lived at 173 Orchid Road, between Skimmer Lane and Violet Lane (about halfway between Jerusalem Avenue and Newbridge Road). 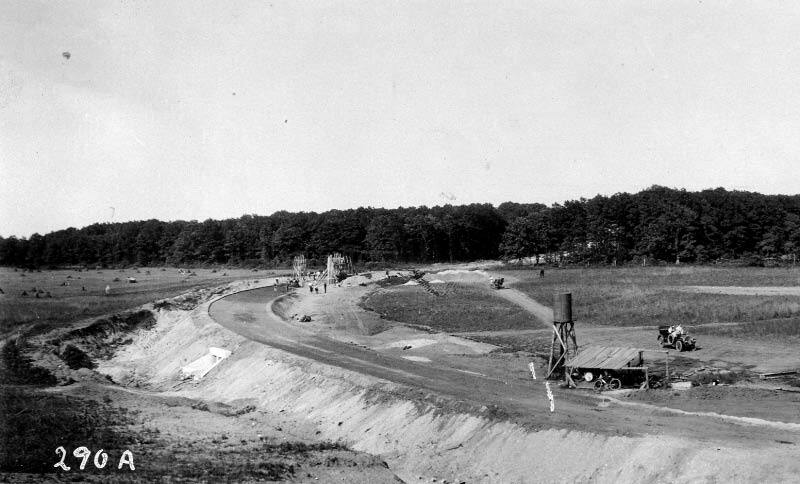 The picture was taken in 1950 or early 1951, behind our house before the sump was built. You can see an old culvert behind my brother Mitch's head. He graduated from Division Avenue in 1965. 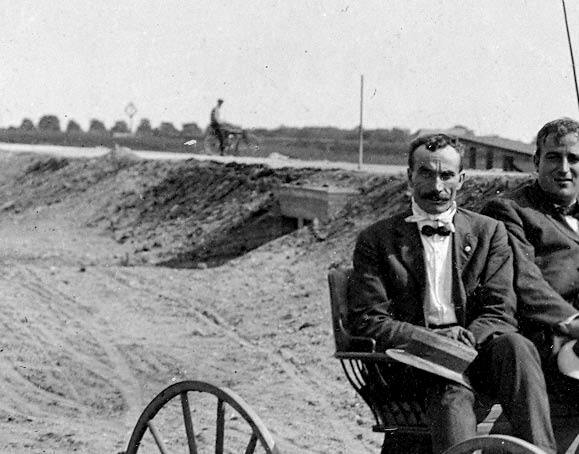 The houses in the background are probably those on the southern leg of Blacksmith Road." According to Jeff Peyton, class of 1961 and my childhood friend, "The sump was even with, or just south of the Old Motor Parkway, a place to my young eyes that was filled with wildflowers and Queen Anne's Lace, oversized brown locusts, and toads. I loved that place." I remember one time a whole bunch of us were hiding out around the culverts in the underbrush playing war games in the early evening just as it got dark. My dad sneaked up on us and shouted to wake the dead. I’ve never been so scared in my life. As he took my brother Mitch and me back to our house, I can remember him lecturing us on properly setting up a perimeter to avoid being surprised by the enemy. Dad passed away in 1995 after a considerable struggle with the effects of Alzheimers. I miss him greatly, of course, and so do all those who knew him. I also have wonderful memories of days exploring the forbidden tunnels inside the sump. We weren’t supposed to be in the sump much less going into those tunnels, but it seems that almost everyone did it. I forget just how far I crawled under the streets of Levittown exploring the sewer system, but I believe I got pretty far north. I remember being somewhat frightened about not being able to back track to the sump after making too many twists and turns into and through adjacent underground tunnels. It would have been exceedingly embarrassing to have become hopelessly lost and then ignominiously extricated by town authorities. One more thing comes to mind. I recollect that before the sump was built in the very early 1950s that we had major flooding all along Orchid Road during a heavy rain. I think my dad was out back with other dads doing what they could to stop the water from cascading into our yards and houses. I always thought (incorrectly I’m sure) that the sump was built shortly thereafter because that flooding had occurred. It’s much more likely it was already on the drawing board. A close-up of the survey in our target area had the following notation " 146 + 50 No Road"
This survey of the Hempstead Plains section of the Motor Parkway did not indicate a bridge west of the grandstand. 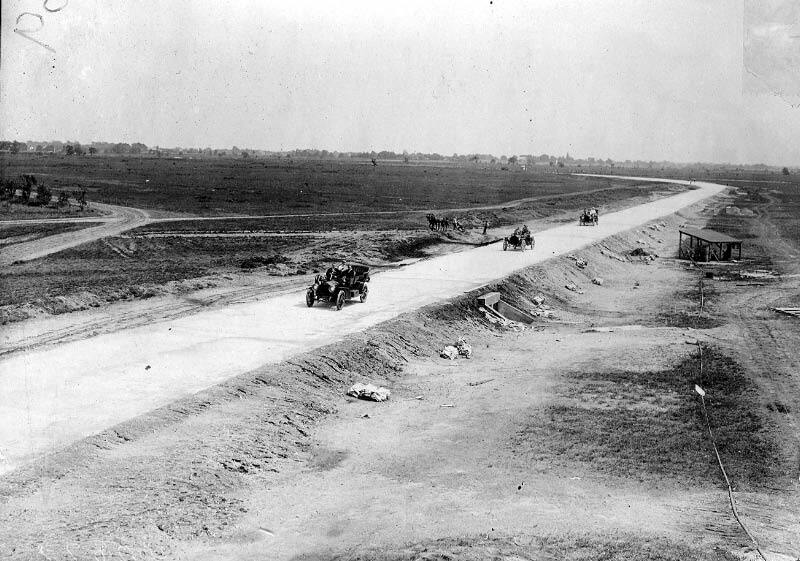 The 1928 Motor Parkway Atlas noted that a highway bridge (H.W.) at station 146 was to be built. 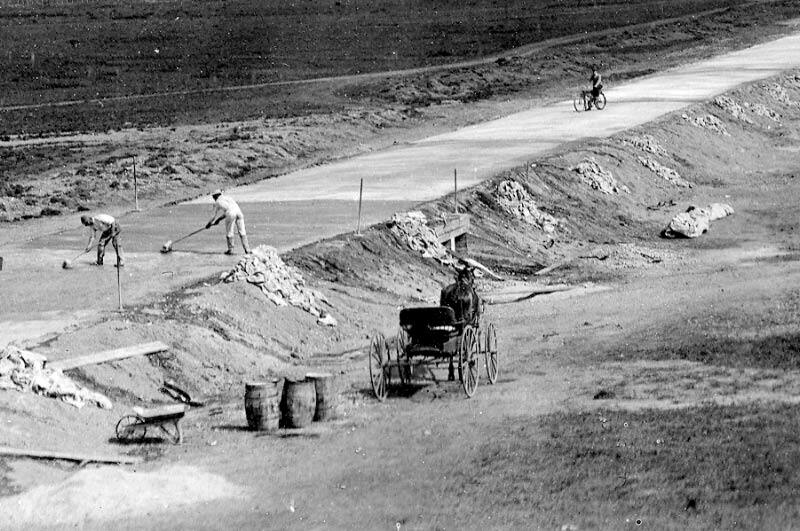 Since the Motor Parkway would have gone under the bridge, clearly it was never built. 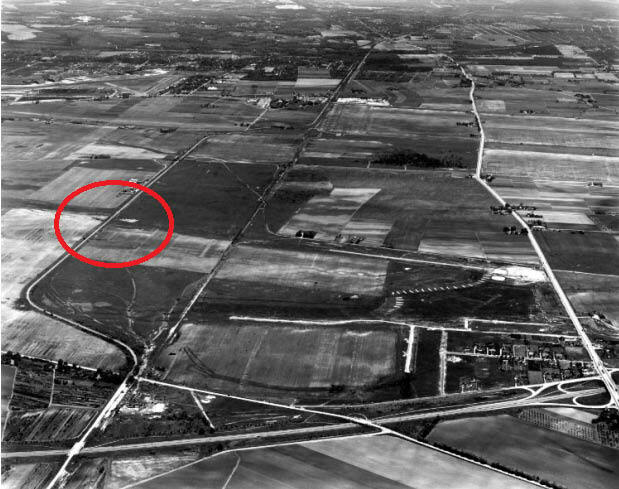 By 1938, there was still no road in this area. East of the grandstand in Hempstead Plains. The Division Avenue Bridge, just west of the Grandstand seems logical. The Pile of debris looks like cutoff wooden ends from nearby house construction. Interesting time for a photograph depicting 2 different eras, with all the new houses coming up and the bridge becoming overgrown and forgotten. I think this might be where the grand stand used to be for the Long Island Motor Parkway at one time. I know it was near Orchid Road Area, in Levittown, I remember reading about it in one of the blogs as well as in the news back when they were voting regarding whether to allow housing to be built on a piece of land near Orchid Rd in Levittown as well or leave it as open space. Ok, I am a bit baffled. Let’s think this through. First, it appears to be a bridge. But if the photo was truly taken in the backyard of 173 Orchid then there should be not be a bridge there. Or? On 4/1/2013 you originally posted the 5/27/1947 aerial photo, and your comments list all the bridges, but not one to the west of the grandstands. Yet the super close up in the photo seems to show something. On 5/18/2013 the post, with the picture “Proposed Fencing @ Grandstand, Aug ‘09 shows a proposed HW Bridge to be build just west of the grandstand. Which would be pretty much exactly where this photo was taken. My final answer, this is a HW Bridge over the old Division Road. I do look forward to this mystery photo being solved. Thank you again. What a great photo with a couple of boys playing around with scrap wood left over from Levitt homes recently built. At first, this photo seemed obvious to me. But now, I’m overthinking;maybe. It’s behind 173 Orchid Rd, so they can be playing north or south of the LIMP. I see the overpass at the photos left. The closest overpass that was near this location was the Jerusalem Ave HWY bridge (LIMP traveling under). 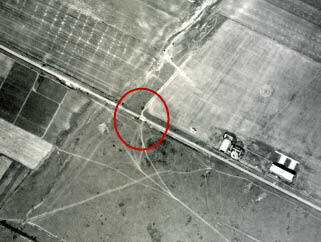 According to an 1949 aerial, this bridge was as “appeared” to be demolished. But, perhaps it wasn’t. I don’t think any LIMP bridges were built between Newbridge Rd and Jerusalem Ave. 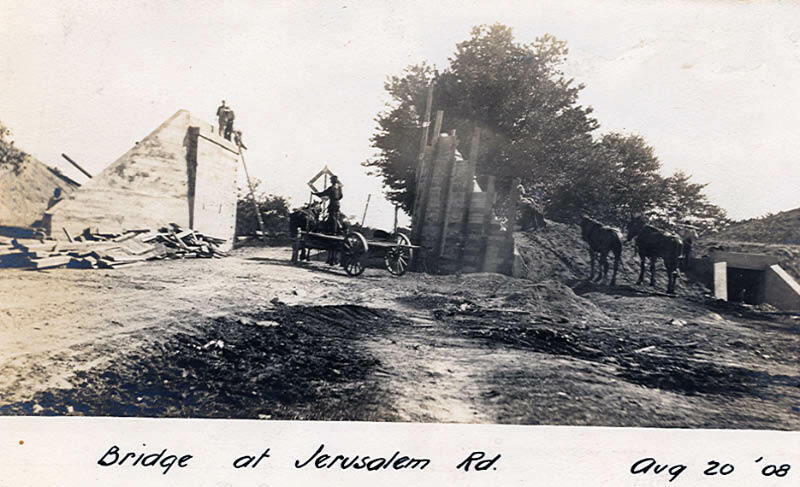 So, my guess is this photo is looking south, with Jerusalem Ave still bridging over the LIMP to the left. But with my guess, their playing a bit of a distance from rear of Orchid Rd. Well, it sure looks like a bridge but the question is a bridge over what? 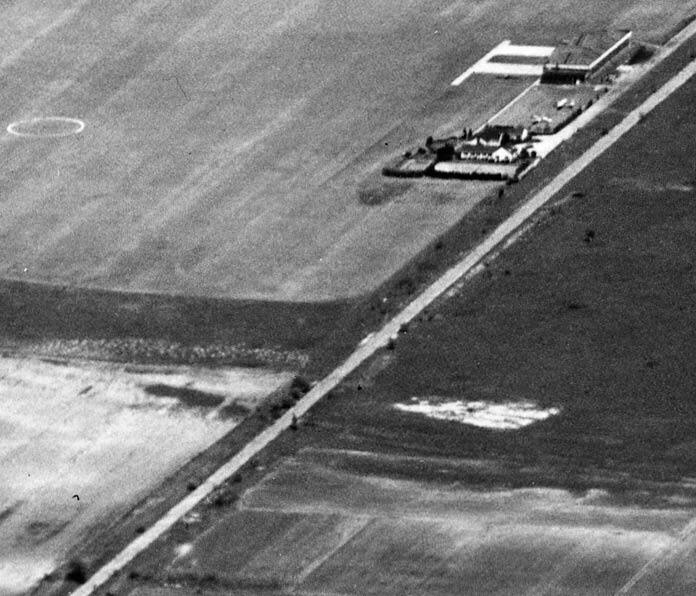 I’m going to take a wild guess and say that it could be going over a southern entrance road to Aviation Country Club that was developed from the old road to the grandstand from Jerusalem Avenue. 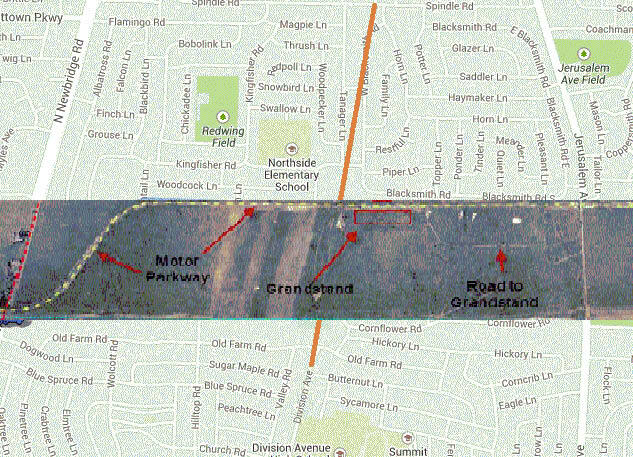 Since Willie K. would not allow direct access to the airfield from the Motor Parkway, maybe this was a later compromise. I believe that bridge crossed Division St [ Ave] . I found a map that showed Division crossing the Central Branch of the LIRR where there was a 1500 ft brick platform to handle passengers going to the races. I was unable to determine when Division was severed but the street continues a little further north and I suspect that Blacksmith Rd is on the footprint of the Division Ave right of way . Looks to be the remains of the pit area located slightly west of the grandstand. To add to my earlier comments , the bridge in the photo is shown on two drawings at station 124. The 1909 drawing makes note of a feature at sta.124 and the 1928 drawing notes Br to be built. In my earlier comments I stated that Division St (Ave) crossed the LIRR tracks and there was a brick platform for passengers going to the race I was in error, as the platform was constructed of cinders and was 1512’ long. Please change the word “bridge” to “tunnel” as to what the “structure” is in my previous guess. Thanks. The area behind the boys is now a catch basin, any trace of the Parkway long gone. When I sent Howard these images his comment was it is a culvert, which is probably what we see. In this area there is a natural valley here, now along the current Violet Lane, that extends well north and south of this area, so some drainage would be needed. While this area is very close to the race Grandstands I have not seen it in the background of any of the pictures. That is the best chance of seeing it again. Howard - looks like a bridge to me! Looking back in the blog I found your 1928 Motor Parkway Atlas schematic from May 18, 2013 (exactly one year ago today) on the Finding the Grandstand page (that was the page that showed us inspecting the then Josato property near Crocus Lane). The schematic shows a bridge to be built just west of the grandstand (M.W. Br. Sta 14E). 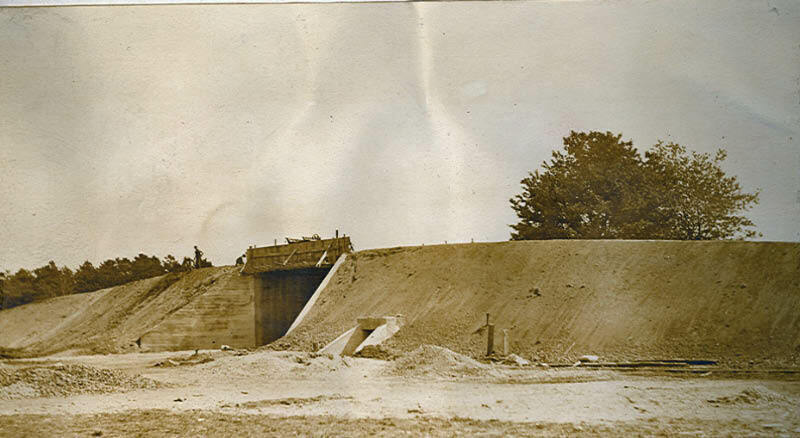 I originally thought that might be it but what you show in the mystery photo is more of a parkway bridge as the parkway runs over whatever is underneath it. However, I then realized that Ernie actually sent the same mystery photo to me a few years ago (he found me by looking at my website and realized we are both Levittonwers) and just yesterday e-mailed him about it. Ernie let me in on what your suggestion as to what the mystery photo might be (a culvert?) so I’m taking me out of the running this week. Incidentally, the area behind that part of Orchard Road is now a sump so very could be a culvert. Bridge over troubled water. 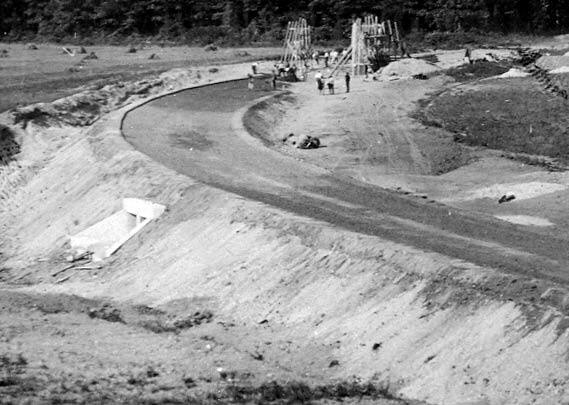 There were two LIMP Hwy bridges to be built on each side of the grandstand that were never completed. This appears to be a pkwy bridge not shown on the motor pkwy atlas, that may have been used to keep storm water off the track. Today there are many storm basins in the Hempstead Plains area including one adjacent to this very spot. Brought back great memories for Bob, playing on that bridge after the roadway was taken up, and all that was left, at that time in the 1940’s, were the beams going across. What a challenge!! The houses in the background appear to be sitting on the curve on Blacksmith Road. On the 1924 Aerial overlay map, I’m not sure if the orange line extending Division Ave is a clue/hint of a future road that was never built, but the only indication that I’ve found of a bridge being at that location would be on the1928 Motor Parkway Atlas that shows; ‘H.W. Bridge Sta 146 to be built’. This one got me. I’m looking forward to the answer! My friend Bob Volkomer who grew up with me in Levittown thinks this is the Division Avenue Bridge. He did extensive research to come to this conclusion so I hope he’s correct. Really enjoyed this week’s mystery, and the photograph of the boys playing with the scrap wood, a classic! 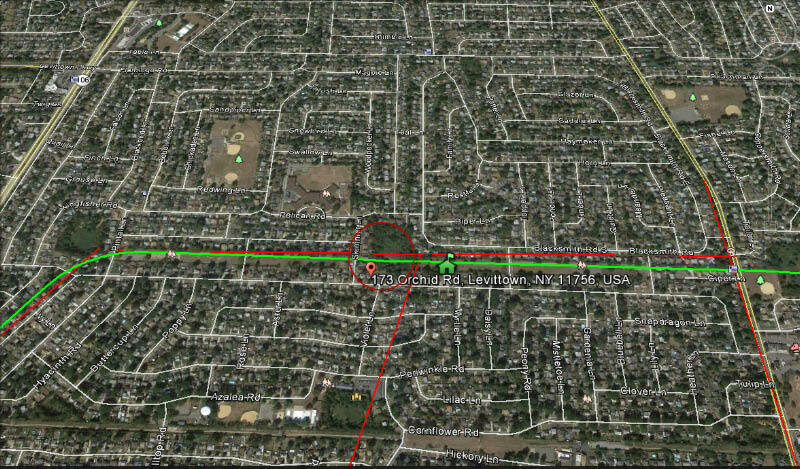 It came to me that the hwy bridges on the motor pkwy atlas may be the same culvert(s) in the mystery, and the Motor Pkwy atlas indicates only location ‘minutes’ without ‘seconds’ (Hwy Br. Station 146 and Station 124). The additional survey posted indicates minutes and seconds (146+50 and 124+50). I’m guessimating that a Parkway bridge carried the LIMP over a grade level roadway underneath, and a Highway bridge was the LIMP always at grade level, travelling under or over something? Not sure what I just typed but hope it makes sense. Just a thought. Frank, the highway bridges indicate the Motor Parkway went under the bridge usually at grade. I believe the highway bridges indicated in this area in the 1938 Motor Parkway Atlas were planned bridges that were never built.